Here be two mates that make the voyage to our mayhem from a port far south o' these waters. Meet Commodore Rusty Blood and Captain Raven Blood. In spite o' their photogenic looks they be ripe fer plunderin the high seas of Depoe Bay! These fine swabbies be known for pillaging a plenty along the coast. Ye be warned! The 2018 treasure hunt was FUN and another huge success! We had 17 teams! Great costumes. Great people. Great prizes. Great PIRATING! We were able to raise over $2,400.00 for our charity, The Depoe Bay Food Pantry. That's, of course, thanks to all you pirates and companies that donated, through team registration fees and fine booty! Check out the IMAGE GALLERY page for some pics from the 2018 event. All the teams are pictured with team names. 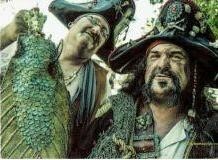 Meet your dedicated crew..... marvel at the Wee Pirates that joined us........... and check out all the fun with images of Piratical Action!